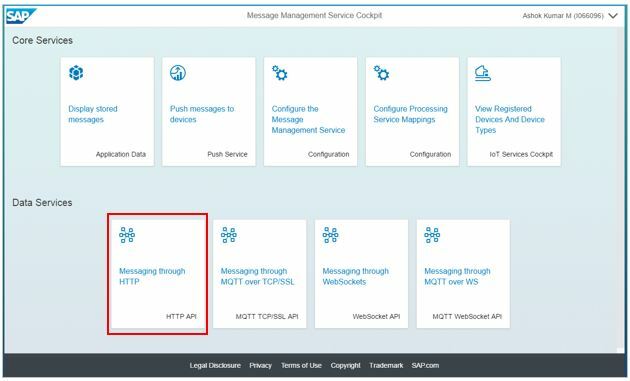 In this blog, I will take you through steps involved in enabling, configuring IoT service in HCP and testing few key APIs provided by the framework, so that you can build applications using IoT services. First time users, click on register and fill the Form. An activation link would be sent to provided email address. Alternatively, SAP employees can click on ‘Log On’ , you will login using SSO. 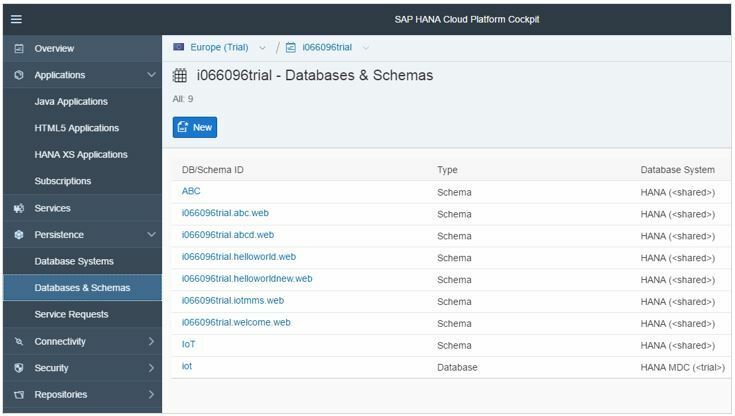 Since you need a Database to work with, In your ‘SAP Hana Cloud Platform Cockpit’, Go to ‘Databases & Schemas’ and create a new Database & Schema. Significance of this Database & Schema(in IoT context) is to bind the IoT MMS application to the HANA DB schema so that the system automatically creates the table to store messages sent by devices configured in MMS. Note: In the hana trial landscape you may not have a Database system. In production/customer landscapes there will be a database system(or you can create a new Database system). 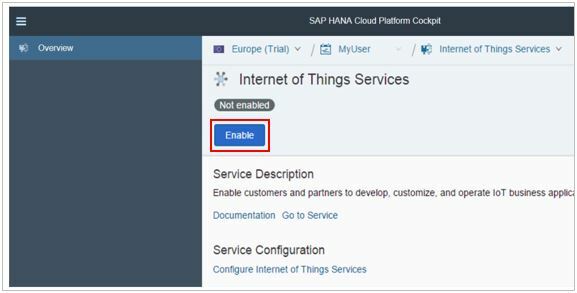 Open the SAP Hana Cloud Platform Cockpit and go to the ‘Services’. Under the ‘Internet of Things’ category, Select the ‘Internet of Things Services’ tile. If the service is disabled, click on the ‘Enable’ button to enable it. Upon clicking ‘Enable’ the service will now be enabled. From the same page, click on ‘Configure Internet of Things Services’ link. In the left tab, select ‘Roles’. Role ‘IoT-User’ would already be present as it is a predefined Role. This role needs to be assigned to users accessing the service. Add your user to the role ‘IoT-User’ in the ‘Individual Users’ table. Click on ‘Assign’ and enter the user Id to assign the role. 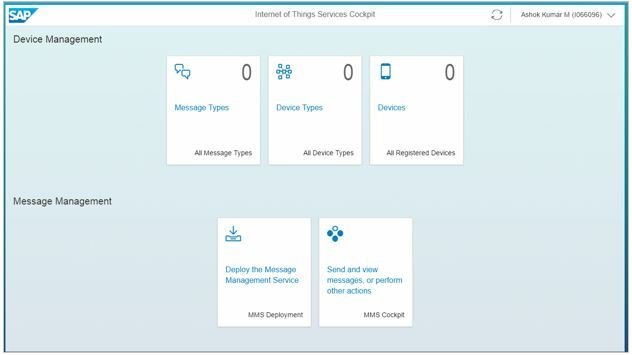 To access the Internet of Things Services Cockpit, IoT services Overview page and click on ‘Go to Service’ link. It will take you to Internet of Things Services Cockpit – shown below. 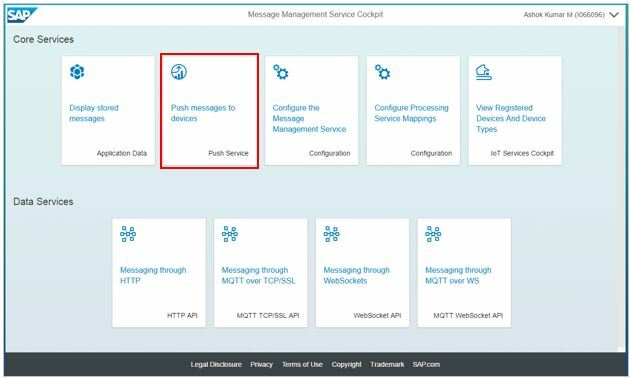 Deploy the Message Management Service (MMS): Under ‘Message Management’ click on the ‘Deploy the Message Management Service’ tile in the IoT services cockpit. In the subsequent page, the Account Settings would be filled already. In the user settings, enter the username and password. Note: for SAP employees, it would be your domain password (as the Hana trial account is linked to SAP ID service). After entering your credentials, click on the ‘Deploy’ button. Wait for deployment to complete as it would take few mins. Once the MMS is deployed successfully, it can be seen under Applications-> Java Applications. It should be in status ‘Started’ (i.e., running). Click on ‘iotmms’ java application. In the application overview page select ‘Roles’. By default the ‘IoT-MMS-User’ role would be added. Assign this role to your user by clicking on ‘Assign’ in the Individual Users section. The default schema would be bound by default. If you want to change it, then delete the existing binding and select New Binding. 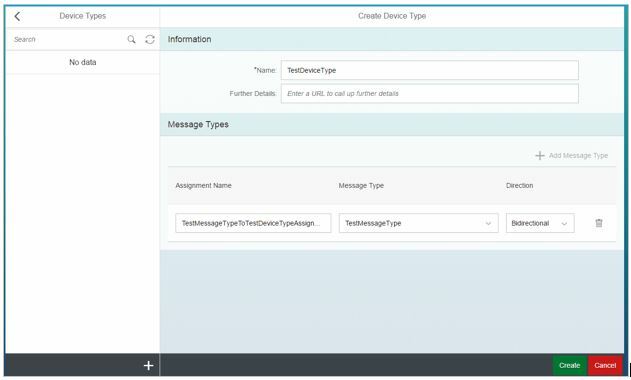 Create a ‘Message Type’: From the IoT Services Cockpit, under ‘Device Management’ tab, click on the tile ‘Message Types’. Click on the ‘+’ sign at the bottom right of the master pane. Provide a name to Message Type. Enter the required fields and choose their data type. Click on the ‘Create’ button at the bottom. To add more fields, click on the ‘+ Add Field’ button. Create a ‘Device Type’: From the IoT Services Cockpit, under ‘Device Management’ tab, click on the tile ‘Device Types’. Click on the ‘+’ sign at the bottom right of the master pane. Provide a name to Device Type. In the Message Type section, click on ‘+ Add Message Type’. Provide a name to the assignment and select the Message Type created in the previous step. Select the message direction and click on the ‘Create’ button at the bottom. Create a ‘Device’: From the IoT Services Cockpit, under ‘Device Management’ tab, click on the tile ‘Device’. Click on the ‘+’ sign at the bottom right of the master pane. Provide a name to Device. Select the Device Type created in the earlier step. Click on the ‘Create’ button at the bottom. Upon creation of Device, the system automatically generates an OAuth token for the newly created device. Note that this OAuth token needs to be passed from the sender to send data to the IoT service. 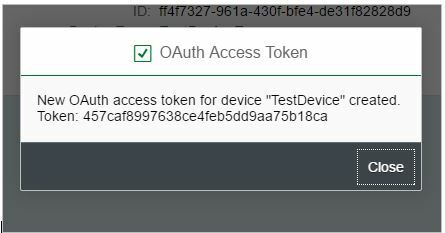 In case if you want to re-generate the OAuth token any time, it can be done under ‘Authentication’ tab of a Device. 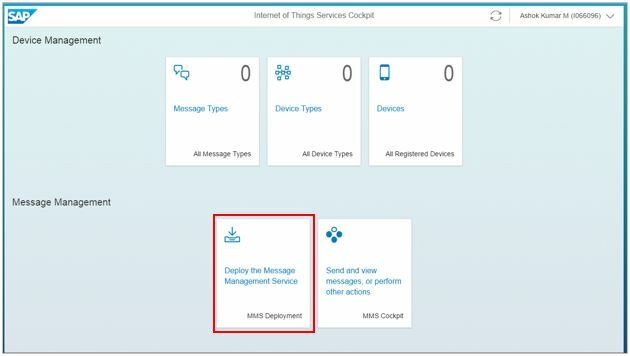 Open Message Management Service Cockpit: To test MMS (i.e., to send receive message in IoT service), Go to IoT Service cockpit and click on ‘Send and view messages, or perform other actions’ to view ‘Message Management Service Cockpit’. To send data to the IoT service, go to MMS cockpit. Under the ‘Data Services’ section, click on ‘Messaging through HTTP’ tile. In the ‘Send Message’ section replace the ‘d000-e000-v000-i000-c000-e001’ in the Data Endpoint url with your Device ID. 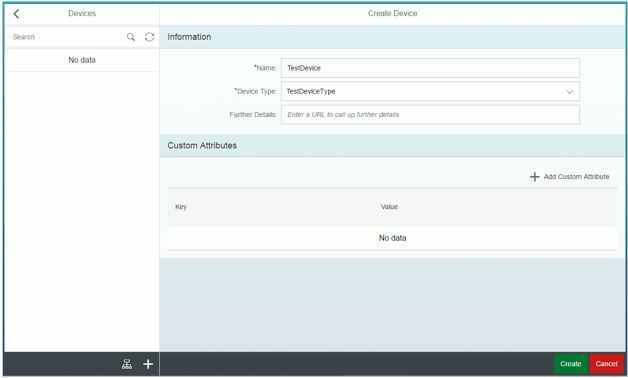 To get the device id, go to IoT Services cockpit -> Devices -> Information tab -> ID. 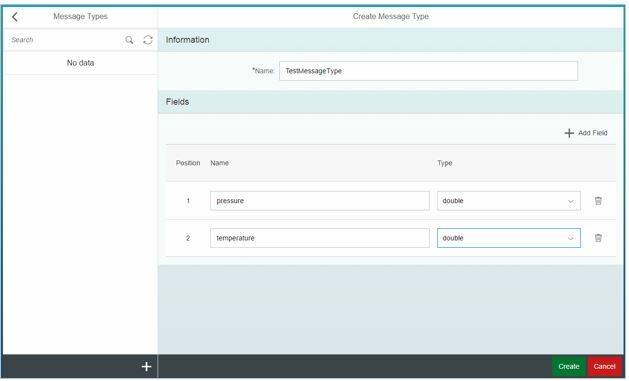 Similarly to get the Message Type id, go to IoT Services cockpit -> Message Types -> Information tab -> ID. Replace the default messageType value ‘m0t0y0p0e1’ with the Message Type ID. Also replace the default messages(sensor, value, timestamp) with your Message Type fields(e.g: pressure, temperature) and its values in name value format. Click on ‘Send’ to post the date into IoT service. Response for the above Send action can be seen in the Reply From Server section. In the Message Management Service cockpit, click on tile ‘Display Stored Messages’. System by default creates a table called ‘T_IOT_<MESSAGE_TYPE_ID>’ to store data coming from devices of the message type. In our case since our message_type_id is ‘662467f5fca1a5c6db0f’, the table name is ‘T_IOT_662467F5FCA1A5C6DB0F’. Click on the table name to view the table contents. In actual production/customer usage scenario, the IoT service MMS can be bound to an application specific schema in HANA so that the table is created in that schema. Data stored in such table(s) can be processed in the applications that are built on top(Native HANA Applications or other approach). 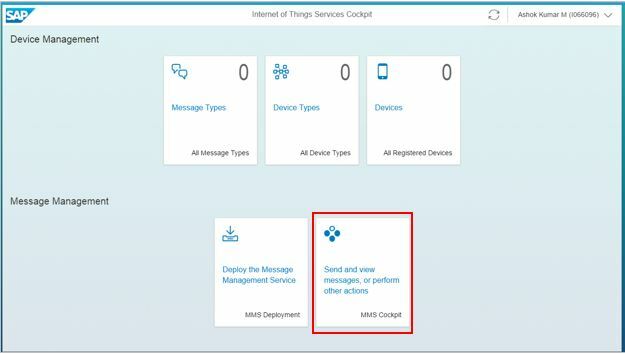 Also, the IoT service MMS can be used to send acknowledgement and/or data to the devices connected to IoT Service. Could you help me, how to edit the message types which we already created? I had tried altering the table but the same is not reflecting on the cockpit UI. Can you try re-creating the message type? is the Internet of Things service disabled now in the Neo environment? When will it be enabled in cloud foundry? There is a different version of IoT framework available in Cloud Foundry version of SAP Cloud Platform. The one in neo version is not longer available for consumption. Thanks for the nice blog. I have two queries pls. I can access the IOT on neo with my Suser id. It’s a hanatrial account. I am able to receive the data as per the steps in this blog. I want to further send this data to backend when a threshold value is reached so that maintenance order can be created in premise(s4Hana). Could you pls suggest what needs to be done for it? 2. I created another account on hana trial with my personal email id. And here I cannot access IOT on neo. 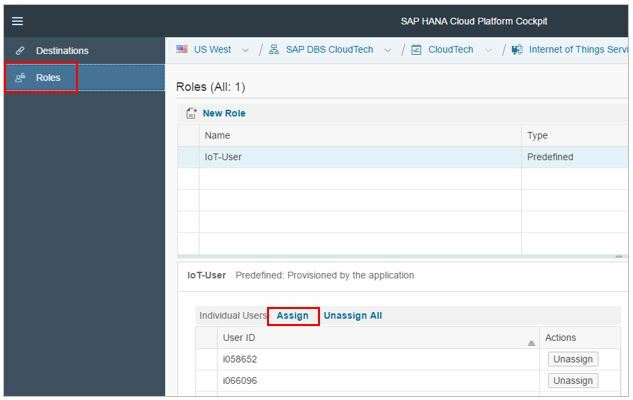 Could you pls confirm the following statement of yours: There is a different version of IoT framework available in Cloud Foundry version of SAP Cloud Platform. The one in neo version is not longer available for consumption. 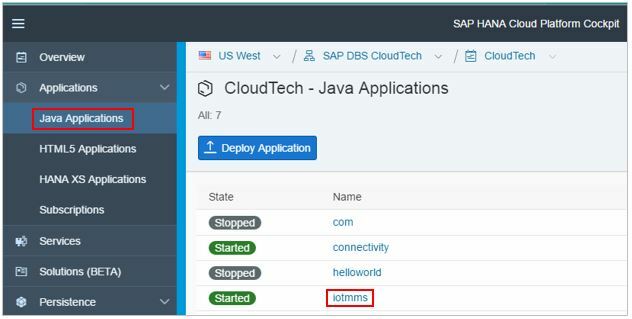 Create an oData service in S/4HANA system so that it can receive data from external systems – in this case HANA in cloud platform. Now, for the orchestration of maintenance order creation can be done in many ways: a. 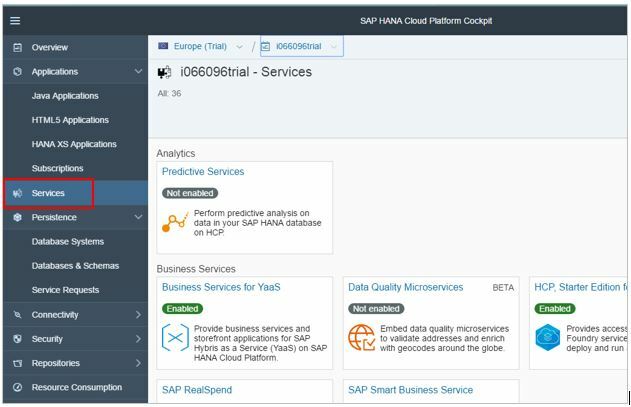 You can use a middleware to periodically read data from HANA in cloud platform and push it to S/4HANA b. 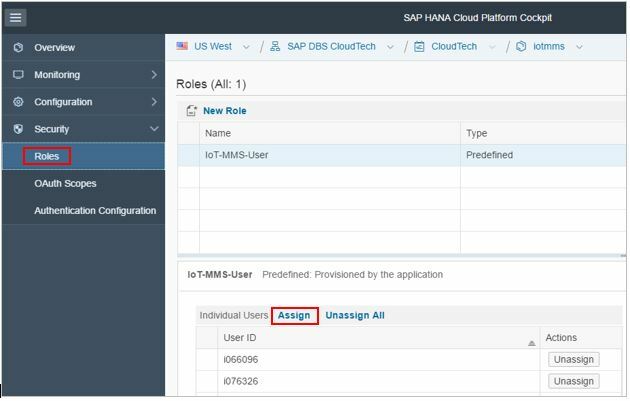 You can have a normal abap report that is scheduled as background job which can sync the data from HANA in cloud platform and S/4HANA c. You can have a XS job configured as part in HANA in cloud platform which periodically pushes data to S/4HANA system. You may not find it in your new neo account as IoT service is available in the cloud foundry version of cloud platform. Try creating a trial CF account. If you had enabled the service in the past, you may see it in your neo cockpit. The IoT service in CF is the next version with tons of features and support to many protocols like MQTT. Many thanks for the prompt reply. I will try with abap report as background job and in case I have further queries about it, I will let you know. Interesting to note that IOT is CF will have support for MQTT. In trial CF account it’s not available as of now. As I am making a POC with iotmms on Neotrial , I hope that support IOT on existing accounts would continue in coming months.